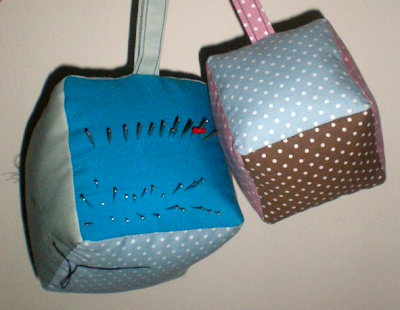 Another type of pin cushion. Bigger one is mine & the cute one is for my MIL. Very easy to make. Prepare 6 squares of fabric with same size. I used 3 diferrent fabrics for each pin cushion(2 squares of each fabric). Ensure each side of square are sewn with the other's. Left a small gap open at one side for you to put in fiber. Stitch the open side by hand. And that's it your cube pin cushion.